GM said today it plans to produce two mid-sized vehicles at its Spring Hill, Tenn., assembly plant but did not identify the models. The plant currently builds the Chevrolet Equinox SUV. DETROIT (Reuters) -- General Motors Co. said it will boost investment in its Tennessee assembly plant by $167 million for the production of two future vehicles. The automaker today said the added investments at the plant in Spring Hill, Tenn., come on top of the $183 million it had previously planned. The plant currently builds the Chevrolet Equinox SUV, but GM said it will add two future mid-sized vehicles it did not identify. Spring Hill was home to GM's former Saturn brand from 1990 to 2007, but ceased vehicle assembly operations in late 2009. Powertrain work continued at the site, but GM restarted assembly there with the Equinox in the third quarter of 2012. 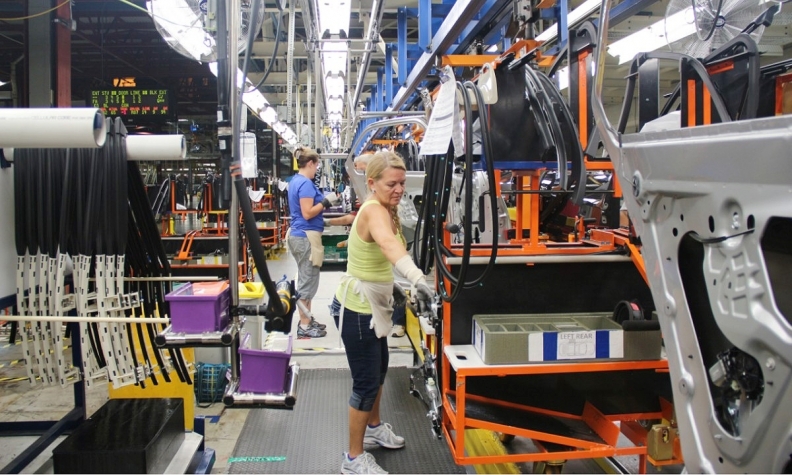 In November 2011, GM announced it would revive assembly work at the plant 40 miles south of Nashville with a flexible production line capable of building a variety of vehicles. It said at the time it would invest $183 million for a future mid-sized vehicle. Today's announcement adds $40 million to that plan, and another $127 million for a second mid-sized vehicle GM had not previously announced. The company did not say when the new vehicles would be introduced. The Tennessee plant employs about 2,000 people, and GM said the new investments will create or retain 1,800 jobs. GM did not provide a breakdown of how many of those would be new jobs.